33rd Anniversary of ELF First Congress. As we start to mark the 33rd anniversary of the First National Congress of the ELF that took place between 14 October and 12 November 1971, a group of an Eritrean elite residing in different parts of the world recently announced at the end of a year-long study that they were: “pleasantly surprised to find out that the ELF-RC is a dynamic democracy as a political organization”. Nharnet.com has received that welcome news as a highly positive and encouraging start by some of our educated and experienced elite in the Diaspora to play their rightful place in researching our past and present. This kind of research will no doubt remind us of learned lessons on what has gone wrong and what is on the right direction in order for us to pursue what is right and to discard what has to be discarded. It was reported that the study was initiated soon after a split occurred in the ELF-RC by concerned Eritreans intellectuals who wanted to know, among other things, if that split was justified. Their aim, we are told, was not to pass condemnations on this side or the other but to find out whether that Eritrean organization picked up for the case study (i.e. ELF-RC) had democratic foundations and practices that could be encouraged to grow and to be emulated for future use. It appears that members of the research team, whose names are not yet made public save that of Dr. T. A. Taddesse, were not sure if there ever existed a steadily growing democratic organization within the Eritrean opposition. To their “surprise”, the organization that they selected for the study showed that it indeed possessed qualities that make it deserve to be called a “dynamic democracy”. To be modest, the indicators and measures used could have been tailored to befit Eritrean and emerging third world standards of democracy and democratic practices. But all the same, that is still something to celebrate at Eritrean level and by all Eritreans. The process of cultivating rudiments of democracy in Eritrea started 33 years ago this month at the first national congress of the ELF and was revitalized and deepened under its mainstream continuum, the ELF-RC, during the past 22 years. However, this finding will not be a basis for unnecessary self-importance and complacency by one group or the other, although it is food for thought for all genuine and straight-minded Eritreans to accept realities and build on them to consummate those unfulfilled ideals of our revolution since its start: national unity, independence, democracy. We are earnestly looking forward to read the research document soon, and it would be to everybody’s interest to see it published not only in English but also eventually in Arabic and Tigrinia. In the meantime, Nharnet Team believes this is an opportune moment to try to inform our young generations that the ELF was not only the first Eritrean political organization to have held a general congress, but it was the first to promote sovereignty of the people organized in their respective social and civil associations. For the sake of brevity, we will present short notes on each of the five congresses that the organization held in the past 33 years. Also for everyone’s record, we will share with our readers an outcome of a small research made on lists of names of all the members of the Revolutionary Council and Executive Committee during the past three decades. The first national congress of the ELF was convened at Arr in western Eritrea between 14 October and 12 November 1971, with 561 delegates taking part. The delegates represented the liberation army, branches of the ELF in the neighbouring countries, key underground members from Eritrean and Ethiopian cities, and Eritrean peasant communities at village and district levels in the then semi-liberated zones. It was held after a long struggle against groups of individuals that had no interest in its convening. c) that the so-called government land being sold (in 1971!) to government collaborators (and others) shall be restored to the people from whom it was taken.. The political programme adopted at Arr helped introduce in the life of the ELF a culture of democratic elections and democratic practices that gradually became a basis for binding together diverse social and political groups in Eritrea to struggle under the banner of one political programme acceptable to all. Leaving behind it the dark years of ethno-regional divisions of the latter part of the 1960s and early 1970s, the congress stressed not only unity in the revolution but also initiated education programmes for political consciousness and awakening of the people and their empowerment as much as the security environment allowed. Thanks to that national democratic programme, the Eritrean people started to have trust in their revolution and embraced it with enthusiasm and devotion. Being the first experience of its kind, deliberations a the congress took very long time (29 days!). It also made technical mistakes like electing an Auditor General and two Executive Committees by vote of the 561 congress participants. One of the Executive Committees (the main one) was part of the Revolutionary Council, the name given to the leadership of the ELF as of that date. Another 19-person Executive Committee with its own secretary was also elected at the congress. The technical mistake of creating ill-defined bodies caused inconveniences and some misunderstandings. However, the system was corrected at the second congress of May 1975. Many changes have occurred in the organization since 1971, but its mainstream, the ELF-RC, has continued to champion that democratic and unitary line which is recognized to be a dynamic process with high prospects of building on it. It is interesting to note that the organization was from time to time in the 1970s referred as the ELF-Revolutionary Council in some Arab media to distinguish it from the PLF, led by Osman Saleh Sabbe, who usually insisted to call his front not simply PLF but with the prefix ELF, i.e. ELF-PLF. As we will refer to it later in this article, the name ELF-RC was made more known starting in the early 1980s when the mother organization broke into three factions because of and in the aftermath of a one-year war with EPLF/TPLF. Shihem Ibrahim Shihem (later deserted to the enemy). Ali Osman Hinti, chairman of Eritrean workers’ union. The second national congress of the ELF was held between mid- to 28 May 1975 at a time when the Eritrean revolution was already making major advances in the military, political and diplomatic fields. The congress, convened at the Sheriit area of Ansaba or at the confluence of the Barka and Ansaba Rivers, had to change meeting sites twice within that area because of Ethiopian air bombardments. It was attended by 949 democratically elected delegates representing the army and all sections of the people supportive of the struggle for national liberation. At the second congress, the previous national democratic programme was upgraded and enhanced to accommodate new challenges and emerging realities. The insistence of the organization on having only one broad national democratic organization in the field for the intended initial military victory was re-evaluated. The congress adopted democratic dialogue as the main method of resolving secondary contradictions. However, one major problem that erupted at the congress was the unwarranted advocacy by the outgoing vice-president, Herui Tedla Bairu, for the representation on one-person-one-vote basis of a large force of new recruits who had virtually no knowledge of the organization at that time. (The fresh recruits were much larger than the old ELA.) This divisive mobilization roused religio-regional fears and perceptions that led to embarrassments and eventual mistrust among comrades in the front; its adverse consequences greatly inhibited national unity, and was one of the probable causes for the eventual weakening of the front, at least militarily. As shown below, Herui Tedla was not one of the 41 Revolutionary Council members elected at the second congress. Between 1975 and 1982, the number of RC members was affected by martyrdom (5), and suspensions from membership of half a dozen members due to their roles in encouraging extremist tendencies (the so-called ‘Falul/anarchistl’ and ‘yemin/rightist’ movements). The other major negative development in the ELF followed the military defeat of the organization in 1981 by the combined forces of the EPLF and TPLF. The ELA was disarmed by the Sudan and camped at two camps of Tahdai and Korokon. While in those camps, the army experienced splits. One wing took military action at Rasai against the legitimate leadership on 25 March 1982 while the organization was preparing to start a conference to resolve problems. Another wing opted to return (‘Saghem’) to Eritrea and try its luck with the EPLF (and TPLF). The third wing – the General Trend - opposed both extreme poles and called for the continuation of the organization in one piece based on laws and resolutions of the previous congresses. Nicknamed as Teyar al-Am (general trend), this mainstream of the organization became known as the ELF-RC as of 1982 (for details, see Nharnet, Profile of the ELF-RC). 1. Ibrahim Mohammed Ali (who played central role in rebuilding the mainstream organization into ELF-RC), 2. Dr. Habte Tesfamariam, 3. Tesfai Woldemichael (Degiga), 4. Haileab Andu, 5. Khalifa Osman, 6. Ahmed Nasser (who was among the imprisoned EC members), 7. Ghirmai Ghebreselassie (Keshi), 8. Yusuf Berhanu, 9. Tesfai Tecle, 10. Ahmed Mohammed Abdu, 11. Azien Yassin, 12. Ibrahim Ghedem, 13. Amna Melekin, 14. Ghebrai Tewelde (who went with Saghem) 15. Ibrahim Toteel (who went with Saghem) 16. Amna Melekin (withdrew from the ELF-RC soon) and 17. Tesfamariam W/Mariam (was in hospital in Cairo and migrated to USA soon after his return to the Sudan). 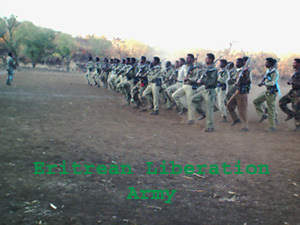 To cut the long story short, the ELF-RC emerged relatively stronger than the other factions in spite of facing many obstacles by EPLF and other Eritrean rivals and stringent interferences by outside forces in 1983-84 that were spearheaded by Saudi Arabia and supported by Sudan’s Jaafer Numeri, all reacting against what had happened to the ELF in 1981 in the hands of the combined forces of the EPLF and TPLF. The ELF-RC was wanted to literally disappear as organization; however, its rank and file went underground, and were able to weather all those continued persecutions, imprisonments, kidnappings and killings in the Sudan. When the foreign-supported alliance led by a Saudi national, Abdallah Bahabre, floundered and the general political environment changed, the organization came out of hiding and organized two organizational conference in Khartoum and Kassala during 1984-85. Through those democratic channels, the organization created a new transition leadership consisting of the RC members who supported the General Trend (ELF-RC), members of the Provisional ELA Committee of April 1982 in addition to other senior political cadres. The ELF-RC thus revitalized its political operations and strengthened activities of its armed units inside Eritrea, mainly in the Gash region. It was this body that led the organization towards its third congress. In addition to the former executive members, other key leadership elements who filled executive posts this turbulent period included Rezene Leulekal, in charge of the economy office, Gherezgheher Tewolde, the foreign office and Abdalla Hassen, the military office. Naturally, the third national congress of the ELF should have convened in 1979 and not 14 years after the second congress of 1975. However, we have observed how stormy the epoch under review had been for the organization. Many even took it as a miracle to see the ELF-RC holding a normal congress after all what it witnessed during an entire decade starting in August 1980. The third congress was convened at Togan in the Eritrea-Sudan borders. It adopted an upgraded programme and elected a 31-member Revolutionary Council. Some of the RC members were elected in their absence because a few could not be at the congress site due to illness or other technical problems. Between June 1989 and October 1995, change of Executive Committee portfolio holders was fast and frequent due to rapidly changing life events and political developments. For instance in the foreign office alone, Yusuf Berhanu was replaced after a year by Mohammed Nur Ahmed who in turn left the post to join the EPLF government, and was replaced in December 1991 by Seyoum Ogbamichael. In April 1992, Woldemariam Bahlbi and Teklebrahan Gherezadiq were kidnapped by the new regime in Asmara and were replaced by other RC members. It was also during this period that Idris Humedia for sometime until he joined the government-side held the post of social affairs and Omar Mohammed, the information office. at the 4th Congress). The session took place in Damascus, Syria, in the summer of 1997. The ELF-RC held its 4th general congress in two places during the summer and fall of 1995. This was done due to visa problems in a number of proposed venues for the congress. Finally, part of the congress was conducted in Kassel, Germany, attended by representative delegates from branches in Europe, North America, Australia and some from the Middle East. The second half of the congress was held in October 1995 in Khartoum. One of the significant resolutions at the 4th congress was the declaration that the ELF-RC will use all means at its disposal to topple the dictatorial regime in Eritrea. It is to be recalled that the organization decided in 1992 to suspend use of arms against the new regime in Asmara opting for democratic means to mobilize the people for change. Based on the 4th congress decision of 1995, the Revolutionary Council in the summer of 1997 decided to establish “political mobilization units whose self-defense is well secured”. This picture depicts the 3rd regular RC session of the 5th RC (i.e.RC elected at the 5th Congress). 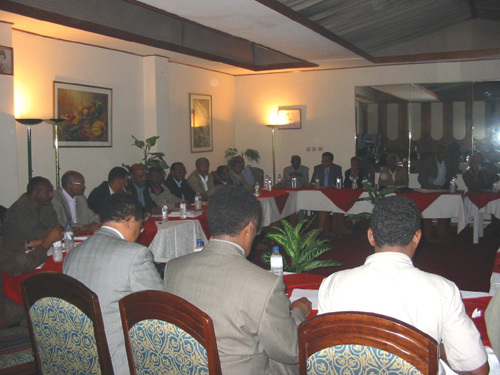 The session, which preceded the split in the ELF-RC, was held in June 2003 in Addis Ababa. Osman Shum/Mahmoud Hamid – obtained tie-vote. Like the 2nd RC, the 5th RC was affected by split. The mainstream ELF-RC was supported not only by two-thirds majority of the RC (i.e 19), but it also had the support of over 90 percent of the total membership of the organization worldwide. The splinter group was supported by 13 members of the leadership. One ELF-RC veteran and long-time active member of the RC, Khalifa Osman, resigned from the post and froze his activities with the organization. The struggle continues for establishing a democratic Eritrea of institutions and rule of law. The ELF-RC is scheduled to hold its 6th congress within the year 2005, hopefully inside Eritrea! !